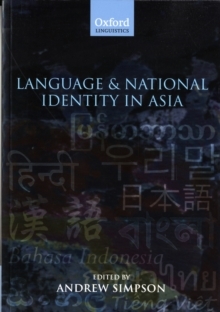 Language and National Identity in Asia is a comprehensive introduction to the role of language in the construction and development of nations and national identities in Asia. Leading scholars from all over the world investigate the role languages have played and now play in the formation of the national and social identity in countries throughout South, East, and Southeast Asia. They consider the relation of the regions' languages to national, ethnic, and cultural identity, and examine the status of and interactions between majority, official, and minority languages. Illustrated with maps and accessibly written this book will interest all those concerned to understand the dynamics of social change in some of the most important countries in the world. It will appeal to all those studying, researching, or teaching issues in Asian society, language, and politics from a comparative perspective.